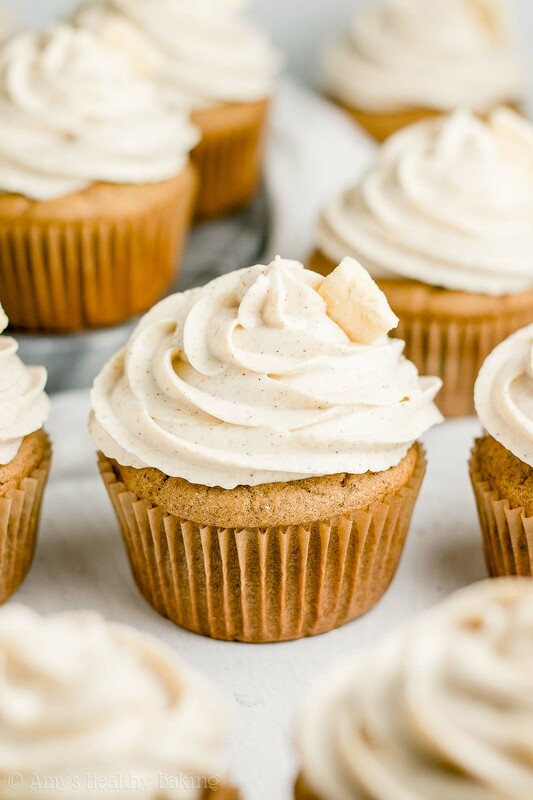 Learn how to make tender spice cupcakes with fresh apples & topped with cinnamon frosting—all from scratch! They’re just 114 calories & contain no refined flour or sugar! Just a few days after I moved into my house last summer, I knocked on a few of my new neighbors’ doors with plates of these, these, and these… Although slightly surprised, they were still extremely welcoming and gracious as they accepted my homemade treats. They couldn’t believe that I was the one baking for them—usually it’s the other way around when a new person moves to the neighborhood! I quickly explained how Amy’s Healthy Baking was my full-time job, and I reassured them that they were doing me a favor by taking all of those sweets off my hands. While I eat some of everything that I bake, I don’t exactly want to polish off an entire pan of brownies or two dozen cookies by myself… Especially knowing how many new recipes I test each week! Back inside, I unwrapped one of them and called over my little dog. I let her sniff the pup-cake, and she looked up at me with questioning eyes, as if to ask, “Is that really for me? It looks like a human treat…” I laughed as I gave it to her, and she immediately dashed over to her bed to devour it. Not a single crumb was left! Yet now, my little dog comes running into the kitchen any time I bake cupcakes, including these Healthy Cinnamon Apple Cupcakes… She thinks they’re for her! Instead, I gave her a couple leftover apple slices and saved these cupcakes for us humans! These healthy cupcakes are supremely tender and full of cozy spice flavor. 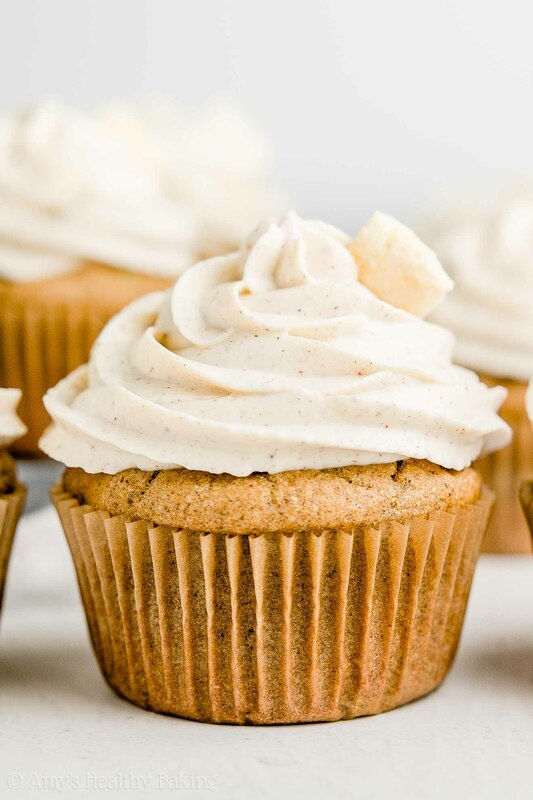 They basically taste like apple pie, just in cupcake form! 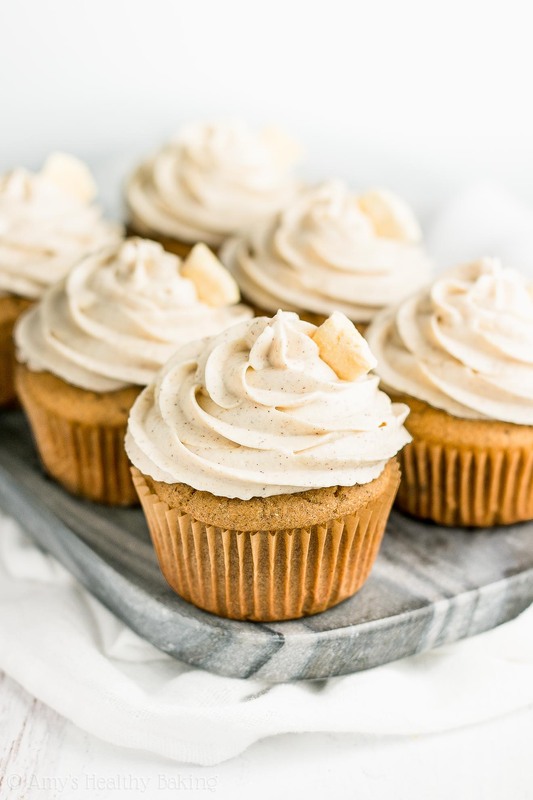 Yet unlike traditional apple pie with its calorie-laden crust and sugary filling, these cupcakes contain no refined flour or sugar and only 114 calories! 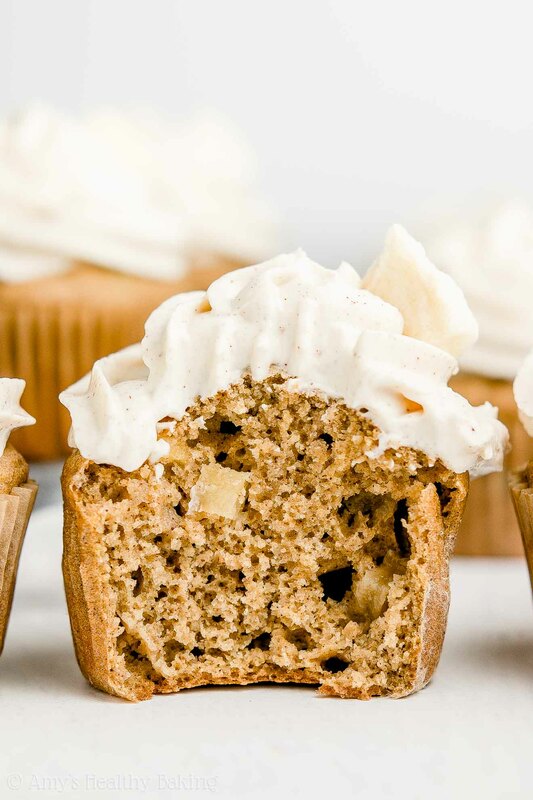 Let’s talk about how to make these healthy apple cupcakes! You’ll start with white whole wheat flour (like this!). It’s not a combination of white (aka all-purpose) flour and whole wheat flour! Instead, white whole wheat flour is made by finely grinding a special type of soft white wheat (hence the name! ), whereas regular whole wheat flour comes from a heartier type of red wheat. 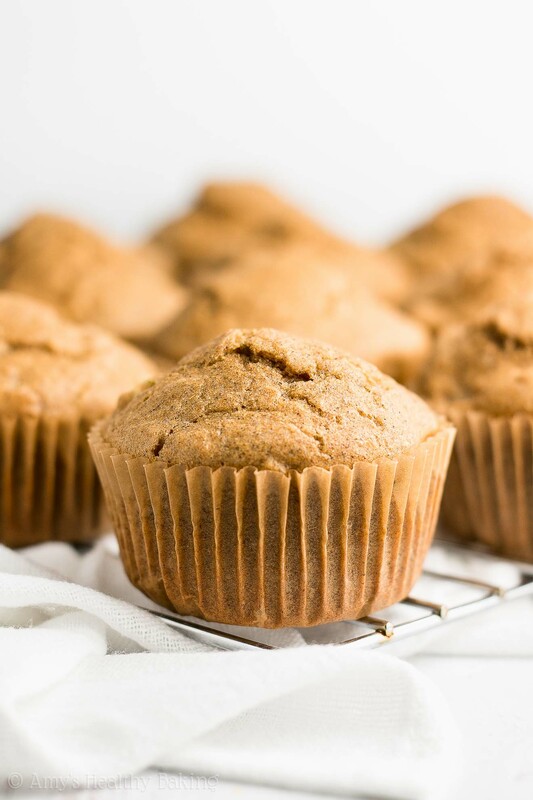 While they both have the same health benefits, white whole wheat flour has a lighter taste and texture, which lets the tender texture of these healthy apple cupcakes truly shine! Hint: White whole wheat flour and regular whole wheat flour is similar to the difference between red and green grapes! Same health benefits, just a different color and slightly different taste! Then you’ll mix a trio of spices into the flour: cinnamon (I’m obsessed with this kind! ), allspice (like this! ), and nutmeg (like this!). Allspice is actually a single spice, not a mix of spices! Its name can be confusing… But allspice is named because it tastes like a combination of cinnamon, nutmeg, and cloves. The allspice and nutmeg give a richness and added depth to the spice flavor, so don’t skip them! Unlike traditional cupcake recipes (or even traditional apple pie recipes! ), these healthy apple cupcakes only contain ½ tablespoon of butter. Yes, that’s it! The rest of their tender texture comes from… Do you know? If you’ve been around my blog for a while, I’m sure you do. It’s Greek yogurt! Greek yogurt adds the same moisture to your cupcake batter as extra butter or oil, and it gives your healthy cupcakes a big protein boost, too! 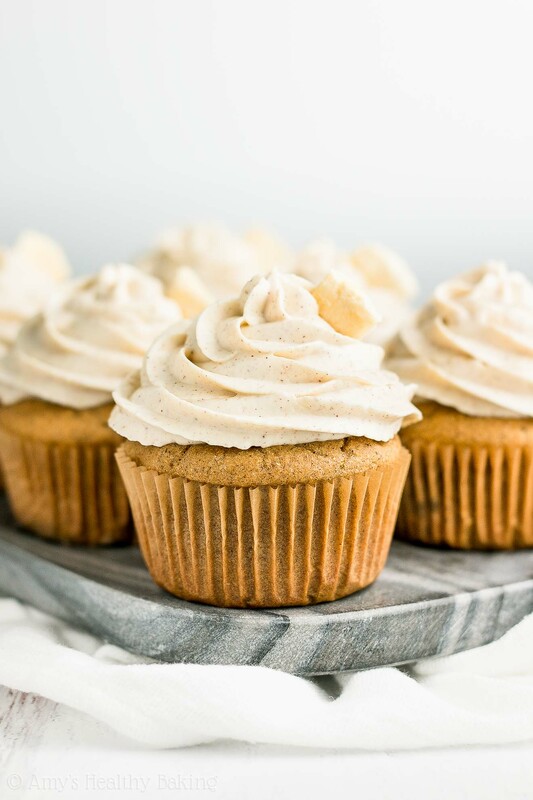 You’ll skip the refined granulated sugar and sweeten your cinnamon apple cupcakes with another one of my favorite ingredients: vanilla stevia (like this!). Stevia is a plant-based, no-calorie sweetener that contains nothing refined or artificial (aka it’s clean eating friendly!). It’s also highly concentrated. You just need 3 ½ teaspoons to sweeten this entire batch of cupcakes! Time for the most important part… The diced apple! I use red Fuji apples because they have a perfect texture for baking (nice and firm! ), and they also have lots of natural sweetness. Remember to dice them finely, no larger than the size of chocolate chips, to ensure they full cook through and soften while your cupcakes bake! But before you dollop your batter into the pan, remember to coat your cupcake liners with cooking spray! Low-fat batters like this one stick to liners like superglue, so coating them with cooking spray first ensures that the liners easily peel away. Ready to make the healthy cinnamon frosting? It actually starts with more Greek yogurt! This is my favorite Greek yogurt for frosting because it’s much thicker than any other brand I’ve tried… And thick frosting holds its shape after piping it onto the cupcakes! But to help it hold its shape even better, you’ll mix the Greek yogurt with instant pudding mix (like this!). Sounds crazy, right?? The instant pudding mix actually thickens the Greek yogurt even more, which gives it the perfect stiff consistency for piping. And of course, we can’t forget the cinnamon (remember, this is my favorite!) and a bit more vanilla stevia (like this!) for that sweet and cozy flavor. In all honesty… I could eat a bowl of this frosting for breakfast! ? 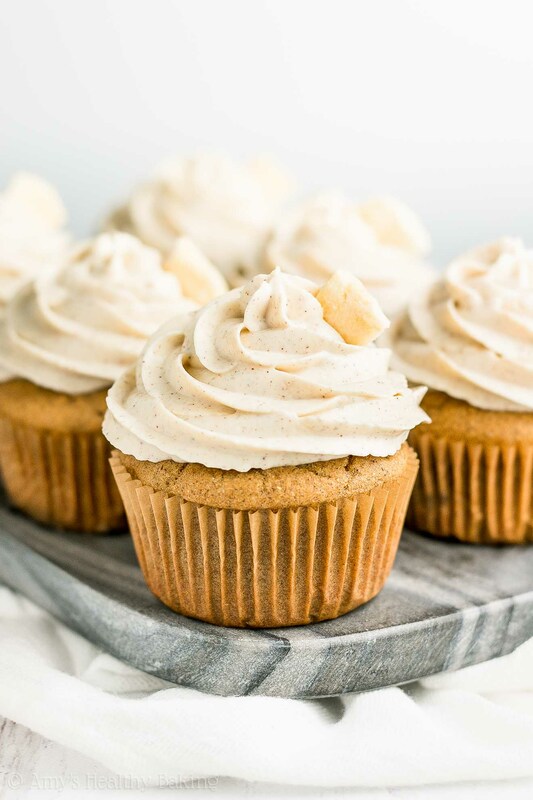 How tempting do these healthy cinnamon apple cupcakes look?? They’re perfect for the 4th of July, Memorial Day, Labor Day, fall days… Or any day you’re craving a cupcake! And when you make your own, remember to snap a picture and share it on Instagram using #amyshealthybaking and tagging @amyshealthybaking IN the photo itself! (That guarantees I’ll see your picture! ?) I’d love to see your healthy cupcakes! 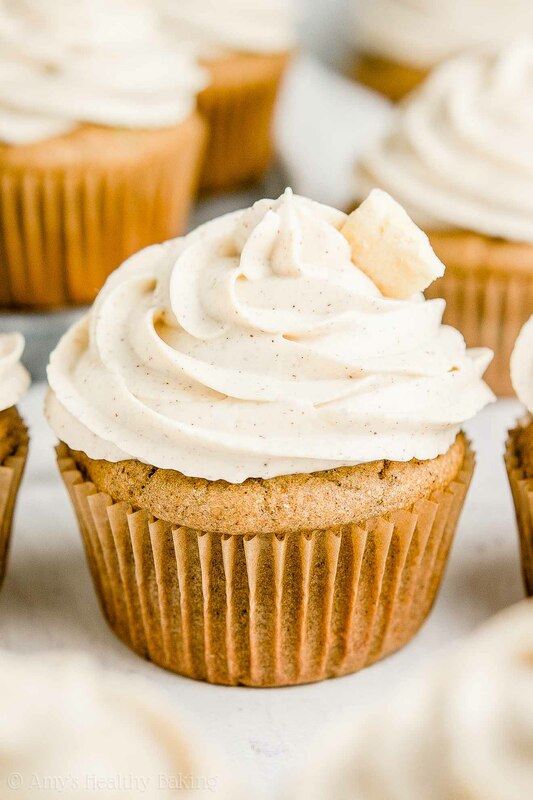 These cupcakes practically taste like apple pie, just in cupcake form! They’re supremely tender with lots of cozy spice flavor, both in the batter and in the frosting. They’re perfect for the 4th of July, Memorial or Labor Day, or any day you’re craving spice cake! Leftovers will keep for at least 3 days (if not longer) if stored in an airtight container in the refrigerator. In a medium bowl, whisk together the flour, baking powder, baking soda, cinnamon, allspice, nutmeg, and salt. In a separate bowl, whisk together the butter, egg whites, vanilla extract, and vanilla stevia. Stir in the Greek yogurt. Stir in 2 tablespoons of milk. Alternate between adding the flour mixture and the remaining milk, beginning and ending with the flour mixture, and stirring just until incorporated. (For best results, add the flour mixture in 3 equal parts.) Gently fold in the diced apple. While the cupcakes bake, prepare the frosting. Add the Greek yogurt, instant pudding, cinnamon, and vanilla stevia to a large bowl. Beat with an electric mixer for 2 minutes. Cover the top of the bowl with foil, and refrigerate for at least 2 hours. Once the cupcakes have completely cooled, pipe the cinnamon frosting on top just before serving. Notes: For the gluten-free flour, use the following blend: 1 cup (120g) millet flour, ½ cup (60g) tapioca flour, ½ cup (60g) brown rice flour, and 1 ¼ teaspoon xanthan gum. Most store-bought gluten-free flour blends (like this one!) should work as well, if measured like this. I highly recommend using the vanilla stevia! It’s one of my favorite ingredients (you’ll use it in all of these recipes of mine! ), and I buy it online here because that’s the cheapest price I’ve found. For sweeter cupcakes, increase the vanilla stevia by ½ teaspoon (for 4 teaspoons total). 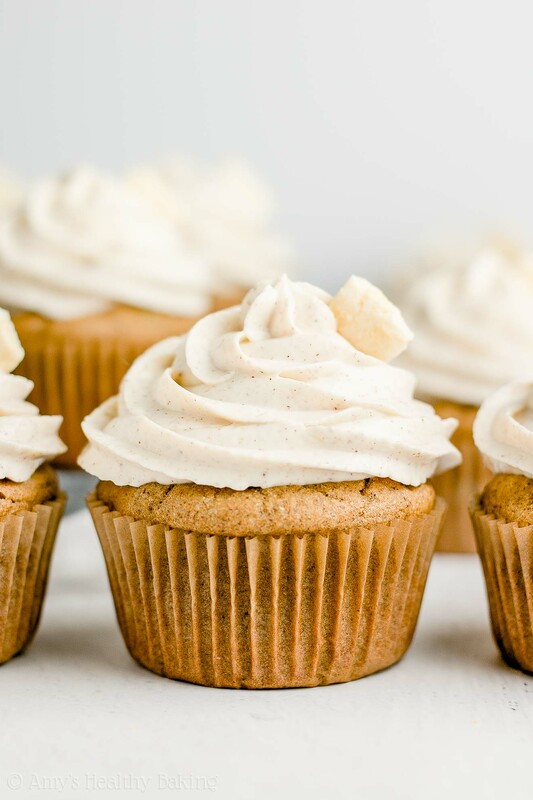 If you prefer not to use stevia in the cupcakes, substitute ¾ cup + 2 tablespoons (210mL) of agave, honey, or pure maple syrup for the vanilla stevia. Omit the milk if using any of those liquid sweeteners. (The batter should be fairly thick, similar to muffin batter.) If you prefer not to use the vanilla stevia in the frosting, then substitute 1 ½ teaspoons of this powdered stevia OR ¼ cup of Truvia or granulated sugar. I use Fuji apples because they have a great texture for baking and lots of natural sweetness. Make sure to cut them to be no larger than chocolate chips to ensure your cupcakes bake evenly. This is my preferred Greek yogurt for the frosting because it's extremely thick! You just need the dry instant pudding mix (I use this one! )—don’t prepare it according to the package directions! You may omit it, but you’ll need to increase the vanilla stevia. Without the instant pudding mix, the frosting will no longer be stiff enough to pipe, so you’ll need to spread it on the cupcakes instead. Especially great tip about the apples – I cringe when people say it doesn’t matter what apple variety you bake with… um, it matters. Stay away from red delicious, hahaha. And the pup cake story is too cute. There is cocoa powder listed in directions but not in ingredients list?? Thanks for catching that! All fixed! 🙂 I’d love to hear what you think if you try these cupcakes! The cupcakes are cool. I stay away from those pudding mixes because: these are the ingredients: M odified Cornstarch, Corn Maltodextrin, Tetrasodium Pyrophosphate and Disodium Phosphate (for Thickening), Contains Less than 2% of Natural and Artificial Flavor, Salt, Calcium Sulfate, Xanthan Gum, Mono- and Diglycerides (Prevents Foaming), Aspartame†, and Acesulfame Potassium (Sweeteners), Tetrapotassium .. I would use an icing made of vegan butter, confectioners sugar and milk. Granted, not low calorie or low fat, but a tiny bit would be enough. Or just don’t frost them. They are delicious plain. I’d love to hear what you think if you try these cupcakes! forgot to ask my original question in my earlier comment. Probably a no-brainer, but just wanted to be double sure: If this were to be baked into a cake, what size pan? Loaf or not? A loaf pan would work best! The baking time will definitely be longer — try starting to check around 35-40 minutes. It’ll be done when a toothpick inserted into the center comes out clean or with a few crumbs attached. I can’t wait to hear how it turns out! I really appreciate your interest in my recipe, Jan! Unfortunately, I don’t have a way to make instant pudding mix at home. I’ve given an alternative for omitting it in the Notes section underneath the Instructions — it can be easy to miss! 😉 I can’t wait to hear what you think of these cupcakes if you try them! Yummm! I can already taste the apple cinnamon! Can’t wait to try these! I was so hsppy to see WW points included with the recipes I looked at! Do these point calculations take into accoint the new zero point foods? I can adjust the points myself if the point are not adjusted. I really appreciate your interest in my recipe, PJ! To calculate, I enter in the recipe in its entirety, and the Weight Watchers calculator gives me the number of points. You’re more than welcome to double check, if you’re concerned! 🙂 I can’t wait to hear what you think of these cupcakes if you try them! The best cupcakes ever. My husband begs me to make these. I am GF but rarely eat GF food, just too high in calories, carbs, etc. but these cupcakes are an exceptional exception to my usual!! Only negative, I had to go past NINE pictures of a cupcake to get to the recipe, a little overkill. You just made my entire day Nina!! That means the world to me that you love these cupcakes and bake them all the time! Thanks so much for taking the time to let me know! 🙂 You can actually find all of my cupcake recipes by clicking on the “Recipes” tab in the top pink menu bar of my blog! On that page, my recipes are grouped by category. Click on the “Cupcakes” link / photo. All of my cupcake recipes will appear! I can’t wait to hear what cupcake recipe you decide to try next!